Because gaming companies have so many different performance and scalability requirements for online games, it’s impossible to create a one-size-fits-all infrastructure for them. Different platforms (mobile/tablet, PC and console) and different business models (Pay-to-Play, Free-to-Play, etc) mean that every gaming company has different needs when it comes to technology, scalability and performance. 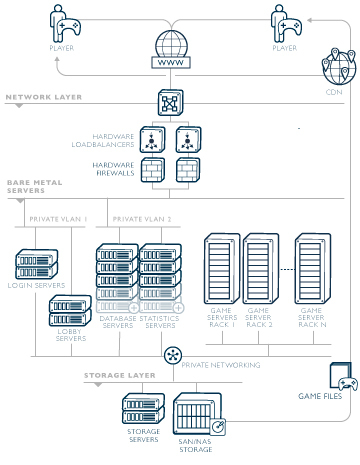 This is why Leaseweb has a targeted approach towards the gaming industry and offers a full portfolio of tailored solutions in datacenters around the globe to customers including Ubisoft, Capcom, Crytek, Hi-Rez Studios and Creative Assembly. Our approach helps gaming companies balance risks and costs in order to capitalize quickly on a successful game. Pay-to-Play gaming companies can relatively easily predict how many people will play a game at any given time. They usually show steady growth and can therefore buy their own hardware or co-locate. To support them even more, Leaseweb can provide a managed network so they will not have to invest in expensive networking hardware to be able to scale up or down when they need to. They can also use additional services, such as scaling with Bare Metal or add-on Cloud Services and a Content Delivery Network (CDN). Free-to-Play games are becoming increasingly popular with users and gaming companies. Gamers can spend what they want on a game, trying it out beforehand. Gaming companies can reach a much wider audience this way. The catch for Free-to-Play companies lies in the fact that it can be difficult to know how many people will play, how long they will stay and how much money they will spend at any given time. These gaming companies run great risks upfront and will look for a scalable, flexible and cost effective model to meet market demands. Since Leaseweb is a large, privately owned provider, we can easily offer the economy of scale and attractive pricing they need. Different platforms require different performance levels in Free-to-Play gaming. Mobile gaming continues to rise but the technical requirements are limited – the graphics are usually relatively lightweight. The scalability requirements however are enormous and Free-to-Play mobile gaming companies therefore look for an extremely flexible solution. MMO (Massively Multiplayer Online) PC games, on the other hand, have huge performance requirements on the CPU level. It is absolutely imperative that MMO games have good performance: maximum uptime and low latency, especially when playing a First Person Shooter (FPS). A distributed and shared cloud solution can cause lags in the games, which no gamer would be happy with. This means that for an MMO FPS, you need bare metal processing power with servers located around the world. It goes without saying that uptime is extremely important in the gaming industry, since no one will make money from an online game if it is down. Leaseweb has redundant networks and redundant routers from different A-class vendors to make sure services will be online 24/7 while staying flexible, agile and cost-efficient at the same time. Last but not least, companies can take advantage of our Pay-as-you-go model for handling launch peaks or big events for their online game. They can scale their platform by adding bare-metal servers on demand and only pay for the time they are actually used. We are very excited about your site and your work on this topic, Thank you for your support to us. we got a clear information and suggestions, they very help us.